I don’t quite understand the Dutch. Cornelius is part Dutch and take it from me, they’re a bit wacky. They wear wooden shoes, their national food is the Indonesian rice dish Nasi Goering and then they exclaim a Dutch phrase that when translated means “an angel peed on my tongue”. This Dutch phrase is uttered after eating something so wonderful that it verges on heavenly. This is what Cornelius said to me after last nights dinner. No doubt, we both laughed hard. This recipe for jerk chicken isn’t exactly traditional as I didn’t have any scotch bonnet peppers laying around, but it did pack quite a punch in the spice department. It was so tasty and pretty and colourful that I’m sure all the angels everywhere let out a communal sigh of relief. We used boneless skinless chicken thighs, but breasts would work too. We also grilled these using our cast iron grill pan, but on an outdoor grill these would be amazing. We served these over rice and a side of asparagus. Yum! 1. Mix together the marinade ingredients and pour most of it over the chicken. Put the chicken in the fridge for at least an hour to marinate. Pour the remaining mixture over the chopped vegetables and toss. 2. Skewer the chicken and vegetables using bamboo skewers making a pretty colour-coordinated mixture of vegetables, pineapple and chicken. If using an outdoor grill, soak skewers in water for at least 1 hr. Add skewers to lightly oiled grill and cook for about 4-6 minutes per side. 3. Boil up the left over marinade until it has reduced by half. 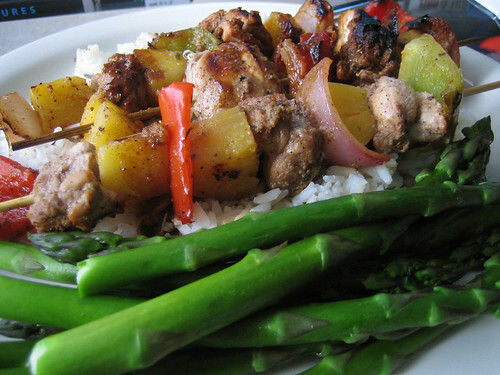 Plate the skewers over rice and pour the jerk sauce over the skewers. Let the angels do their thing. Yum! That looks so great and I normally am very anti food on sticks! oh that’s totally my new saying of the week. The chicken looks delicious by the way! That is the best title ever. That has to be one of the most beautiful blog photos I’ve seen this year! My mouth is watering. Anti-food on sticks, Rachel? How can that be?! I love food on sticks. Darlamay, its the best saying ever, I think! I have no clue how to say it in Dutch, sorry Stefanie. I asked Cornelius and he didn’t know & his parents are on vacation so they can’t help me either. Good luck with dinner! That looks deeee-lish… what is it with vegetables? Oh how I love them so much. I’m a complete veg-head. You have given me some great ideas for dinners this week. Excuse me while I slurp… Slurp! My mom makes jerk chicken and makes a special “dirty rice” or a fried rice to go with it…this reminds me of home. Excuse me again…slurp! haha, rachel! one day i’d love to do a cookbook, one day….. The pineapple sounds like the perfect accompaniment to the spicy jerk chicken. And putting the food on sticks is the perfect way to eat it, very practical! I’m looking forward to trying this out myself. I made this for 6 people using pork and chicken. The only change I made was to add allspice… it just isn’t jerk without allspice! Also, instead of cayenne, I used a custom hot pepper blend containing habenero, serrano, jalapeno, etc. I grilled them over charcoal. With a cooling veggie-mango salad on the side, the meal was loved by all. Thanks for a great idea and recipe! I wonder what that angel was drinking!? Great! – Even Marja liked it. Wes, I’m glad to hear it and I’m glad that you’ve posted the Dutch phrase!